View More In Cold Frames. The Medium Garden Cloches are ideal for medium sized plants that have established roots. These slightly larger plants will benefit from the moisture and warmth provided by a quality plant cover. As plants begin to grow and blossom often times insects and caterpillars begin to infest them. This can be avoided with a secured cloche plant cover. The medium size garden cloche will allow for sufficient space for the plant to grow and for air to circulate. 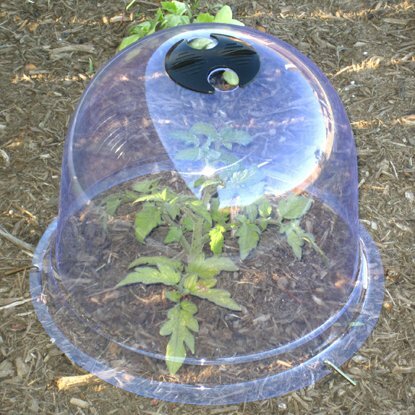 Our cloches are designed to protect your plants from the harsh natural elements, insects and animals. They are made with durable PVC plastic with a UV inhibitor. A built in air vent at the top allows for convenient adjustment of air flow and temperature. Our steel pegs easily fit in the pre-punched holes located around the bottom lip of the cloche to secure the cloche to the ground. Benefits: Frost protection, provides a protective barrier against hungry animals, prevents insects from causing unwanted damage to your plants, a great organic method for insect/animal control, wind protection, snow/hail protection, highly reusable, extremely light weight, super durable, facilitates greenhouse-like warmth, protects while allowing plant to receive sunlight, helps plants retain moisture and encourages growth, easy stacking for tidy storage. These 10" Diameter, 7.5" High Cloches are lightweight, extremely durable and includes a fully adjustable air vent. Transparent UV protected PVC construction - Elegant bell shape promotes even air circulation. Three ground pegs included. Provides a protective barrier against frost, snow, hail, wind, insects, hungry animals. Protects while allowing plant to receive sunlight and greenhouse-like warmth. Helps plants retain moisture and encourages early growth. If you have any questions about this product by TheGardenCloche.com, contact us by completing and submitting the form below. If you are looking for a specif part number, please include it with your message.